Update on 20-Aug: New cryptics. I’m so terrible at keeping my blog updated, eh. Here’s a not-so-standard logic puzzle and two standard not-logic puzzles. 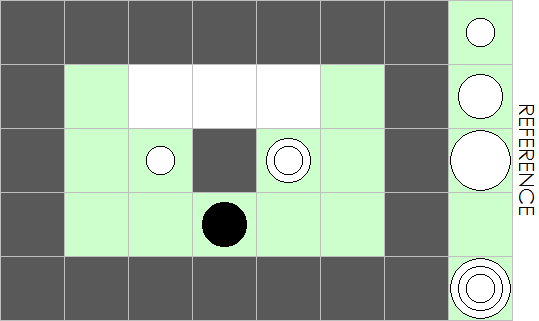 Snake Locate a snake in the grid. The snake is a sequence of shaded cells that do not touch itself; that is, if two cells share a side, then they are consecutive cells in the snake, and if two cells share a corner (but not a side), then they are separated by one other cell in the snake. Clues outside the grid tell how many cells in that row/column are part of the snake. …except, my grid got scrambled. The grid is 5×5. I know the endpoints of the snake are on R1C1 and R1C3. I also remember putting five 4’s to the grid, although I’m not sure in which rows/columns. (A row/column only gets one clue.) Can you solve it anyway? Cryptic crossword clue Well, what it says. Here in the Patzers Club Discord server, for some reason there are a bunch of cryptic clues being thrown about, and I end up making a few. Most of them are easy. Some of them might be unfair, although I tried ditching everything that Patzers Club considered unfair, so hopefully all here are clean. …proper puzzles, that is. I’m in a Discord server. For some reason, it’s much easier for me to post puzzles over there. Probably part of it is the fact that I don’t need to make a proper blog post or something. Probably part of it is because the puzzles I posted were all tiny, not even over 5×5. But now that I get around to it, have all that I have so far! Fillomino Read here for instructions. Four years ago (okay, 45 months ago), there’s Logicsmith Exhibition, back when Grant was still active on his blog (before he migrated to Grandmaster Puzzles). Back then, I was still starting at constructing logic puzzles; you can see my submission there. Here is a “revamped” version: exactly the same layout as before, and each of 1-9 appears exactly four times as in the competition. …okay, I just got this theme idea and toyed with it, to liven up my blog again. Cross the Streams Shade some of the cells black so that all black cells are connected and no 2×2 square is entirely shaded black. The clues outside the grid gives the contents of the corresponding row/column, reading from left to right and from top to bottom. A number means a group of consecutive black cells; two different groups in the same row/column must be separated by at least one white cell. A question mark indicates a single group of unknown size; an asterisk indicates an unknown number of groups (which may differ in size, and there might be no group at all). Meanwhile, I’ve been playing several “programming” games. I’ve completed SpaceChem (finished all obligatory puzzles for the story) a few months back; I got my hands on TIS-100 which I recently completed (but with the upcoming bonus campaign I’ll have several more puzzles to do); I’m redoing Manufactoria after I realized I haven’t completed it. Those might be not exactly the kind of puzzles that you (as in people that enjoy pencil puzzles like this) like, but who knows. Scrabble Fill a letter in some squares such that they form a Scrabble: all cells with letters are connected, every word on the right appears in the grid as a contiguous sequence of letters (not broken with other letters or empty cells) reading right (in the same row) or down (in the same column), and every such contiguous sequence of two or more letters form a word. 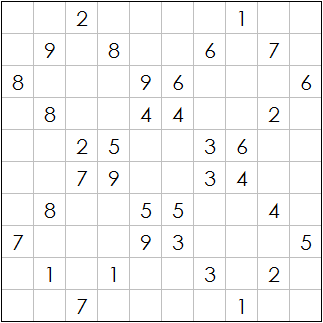 Surprise, a 5×4 puzzle having a medium difficulty. Actually I’m not sure you can solve this without brute force, but given the very small grid I think it should be easy enough to carefully enumerate all possibilities. Posted on 01-Apr-2015 by chaotic_iak Tagged bonzapuzzleword puzzle	CommentsNo Comments on Puzzle 92: Word Puzzle?! Bonza Word Puzzle Arrange the pieces given into a crossword pattern, like in the game (or puzzle genre) Scrabble, such that every contiguous sequence of two or more letters read left-to-right or top-to-bottom spells out a word, which are thematically linked. Also see Grant’s take on this. Let’s say I’m not too inspired. On the other hand, I actually have the game. Of course, I’m always biased, preferring free games way more than games that include necessary in-app purchases (this includes Bonza for locking some of its puzzles, even if there are packs available with coins), but I suppose I should stop here before trashing more on the business model which I myself can’t understand why I loathe so much. The idea itself about “jigsaw crossword” is amazing. (By the way, I should have put the genre name as “Jigsaw Crossword” if I want to be neutral, but eh.) I might tinker with the idea again some time in the future. Yesterday I bought A Good Snowman Is Hard To Build, which is probably one of the rare occasions I actually bought a game. When I’m going this far to write a blog post about it, it’s either very good or very bad; A Good Snowman is undoubtedly the former. The rules of the game are unfortunately not explained explicitly (but you can actually figure them out pretty easily). But because this blog is mostly for deductive puzzle enthusiasts, which loathe MIT Mystery Hunt-style puzzles with absolutely no instructions, the rules of the first part follows. The rules for the second half of the game won’t be written here, because they are just so amazing. You’re in a room with various walls, Sokoban-style, as some sort of featureless monster thingy. You can move in four cardinal directions. There are several snowballs on the grid, as well as some snow on the ground. You can push snowballs around on the ground, but cannot pull them, just like in Sokoban. You also cannot push snowballs to the wall. Snowballs come in three distinct sizes: small, medium, and large. Rolling a snowball over a snow on the ground increases its size and removes the snow from the ground; a large snowball simply “absorbs” the snow, remaining a large snowball. A smaller snowball can be rolled on top of a larger snowball, Tower of Hanoi-style, and can be also pushed down. You cannot roll a larger snowball to a smaller (or equal-sized) snowball. To win, use all snowballs to form snowman(s): a stack of three snowballs (which must necessarily be large, medium, and small from the bottom to the top). In case there are multiple snowmen to be built, once you form a snowman it cannot be disassembled any more. Example follows. 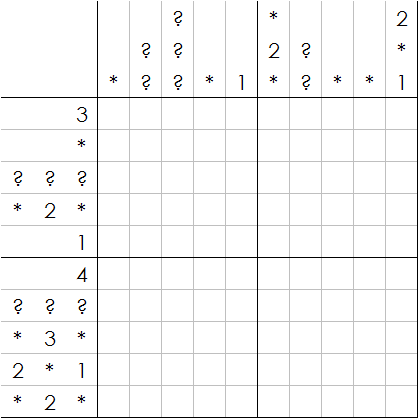 Sample puzzle follows. Solution is right beneath, so be careful. In the above, the black circle is you. The green squares are normal ground, without snow, while the white squares have snow. The gray squares are walls. The part to the right is a reference for snowball sizes, and what you’re aiming for. This puzzle is created by me, so you won’t be spoiled with any of the puzzles in the game, although you might be spoiled on some of the tricks. Assemble .co.id, @yahoo, and chaotic_iak to a string that makes the most sense as an e-mail address. You can browse my pencil puzzles or chess problems. Works on this blog are licensed under CC BY 3.0. Basically, you have no restrictions other than informing me where you decide to use my work. Enter your e-mail address to follow! You will receive updates of this blog delivered to your e-mail account as written.